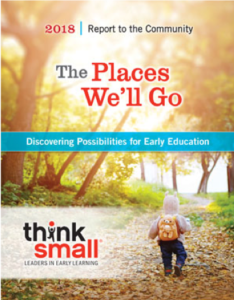 Think Small is committed to advancing quality care and education of children in their crucial early years. We do this by training, coaching and supporting early child care educators as they provide high-quality programs to children; by engaging families; and by encouraging decision makers to keep early learning as a top priority —always using the best interests of children as our guide. Inside this Report to the Community, you’ll find highlights from the past fiscal year as we prepare early childhood providers, strengthen Minnesota families, and catalyze change with our advocacy efforts. Our annual report also shares our financial position as of June 30, 2018, and recognizes the generous contributions made by our volunteers and donors that makes our work possible.